Metric: Teeth. This book has them in profusion and while the drakes are kin to dragons, scales didn't make a big enough impression to match what this book offers a Pathfinder GM. This book finds a niche (low-level draconic creatures) and fills it comprehensively. Character options and twenty-one drakes as well as magic and a drake builder. The colourful art and flavour complements a wealth of content. If you want draconic motifs in your Pathfinder game, get this, you will be very pleased with the outcome. If you're mining for ideas, you've not got far to dig. Chapter 1 introduces the drake, it's ecology and links to their draconic kin, the different types and their place in Midgard and ten famous/notorious drakes. While there's plenty of fluff here, it's useful as it helps evoke a drake's roles as companion, foil and nemesis. Chapter 2 offers character options including reasonable bases for pseudodragon and candle drake characters, feats, alternate class abilities the drake tamer class (a bit different) and master of drake forms prestige class as well as magic for both core and APG classes and items magical and mundane. Chapter 3 offers twenty types of drake, from the alehouse drake (a favourite here obviously) to the tor drake with a variety of roles and capabilities. A drake creation system follows for building your own drake, including an example vine drake (so that's twenty-one) gives you some twists in the tail to catch out know-it-all players. This is a gorgeous book. From the lush cover by Kieran Yanner to the colourful interior panels by Hugo Solis and the clean layout, there are patterns behind the text but these are unobtrusive and there's no formatting slips I could see. Tables and statblocks are cohesive and clear. This book shows how layout can elevate a good product to a great one and Christopher Bodan and Carrie Winters deserve recognition for giving the content a polished presentation. In conclusion, this one gets it very right. Adam Daigle and Mike Welham have given Pathfinder GMs and players a toolbox of stuff for Pathfinder games with a draconic twist. The iconic nature of dragons makes them difficult to introduce at low-levels without judicious management. 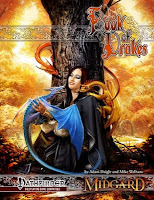 The Book of Drakes provides varied challenges and flavour to spare. It's eclectic nature also means there's something for everyone and GMs are encouraged to dip in and out as required. Thanks for the great review! I'm very glad that you enjoyed the book. Mike, thanks for your comment and thanks for the book - it was brilliant.